Rosko’s pitch butterflied past me and rolled onto Sharpnack Street, and with no Yogi Berra behind the plate, I had to chase it down, along with those 20 unrelated vocabulary words ricocheting in my skull. By the time I’d retrieved the ball and tossed it back to the “mound,” inspiration exploded—another Pulitzer-winner was ready for transcription. When I woke up from my weariness on Mars, I was alert. I had to attempt to coax a passing Martian to share the benefit of his map of the meadow where Chicken Noodle Soup Maiden was not carefree in jail. He said that if I could concentrate in a crafty way that I might distract the extraordinary villain of the Martian frontier and save my friend. Maybe with heroic impact I might manufacture a modest portion of secret sauce that would magically release Chicken Noodle Soup Maiden from her sturdy cell and end her terror before it became tragic. As I followed the map to the meadow, clutching my secret sauce container, I hoped I would be valiant. 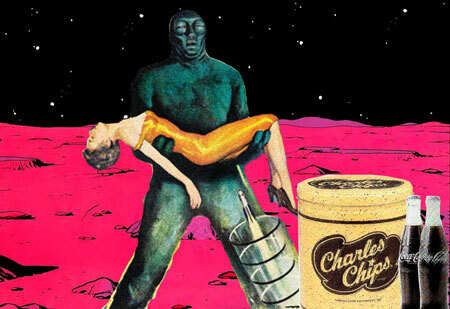 I couldn’t wait for lights-out that night so I could anticipate my next reading and imagine flying past the Martian moon of Phobos, bed/spaceship tunneling through space to the Red Planet, where I’d rescue Carol, fountain Coke in crushed ice in one hand, fistful of Charles Chips in the other. Life quickly went black-and-white when I spied Carol laughing with Joseph Lipshutz, who I somehow decided would marry her. Now she wouldn’t care about my essay, celebrate my newfound ce-blare-ity, and I’d run out of gas up there by the second Martian canal. And while my reading went well, it was followed by fear that I’d soon have an empty tank down here in Philly: Mrs. B handed out a new next batch of vocabulary words. Which I gargled, mentally, all afternoon, through dinner, through Wagon Train, while dad sipped his beer, me my soda, and later, upstairs, where inspiration arrived as I rumbled towards Mars on my headboard ship. My chamber of tricks seemed vacant, and my chances were not very plentiful. How would I resist, in a humble way, the severe plans of the Lizard Man for Chicken Noodle Soup Maiden? I’d spilled my secret sauce! I had to rescue the maiden from her distress, so I made a frantic trip to the lair of the Lizard Man, and in an instant, I was able to recognize his weakness. Shootin’ Shell bullets, with Greenie Stick Um caps, shot from a belt-buckle derringer, would be essential and destructive. My Martian tour finally led me to contribute to the maiden’s rescue and ease her fragile situation. My capable derringer shot hit the Lizard Man’s scaly surface twice, and he fell into a shallow sleep, giving me just enough time to increase my speed and head to the meadow. There, I thought: I met the stern mandate of Superman, not to take a life if I didn’t have to. The Lizard Man was out of commission, the maiden would be free, by the final essay—but not before an Edmonds trip to the Zoo…setting for another element in my interplanetary quest. My essay went down smooth. No glances ‘twixt Joseph and Carol, attention—not rapt, but still—paid and accepted, and I felt more than a little belly twinge as I walked out onto Williams, where, before she made her left and I my right toward Vernon Road, Carol asked how the Maiden, Lizard Man, managed to breathe on Mars. I could feel myself blush—that hadn’t occurred to me: Time for some heroic thinking, the kind a dashing gentleman must master. “I finger-paint. Hope you have a good weekend!” Did she really mean that? Or was that “We’ve talked enough”?